Sweet onions --- 5 ea. Peel and cut onions into rings about 3/4-in. thick. In a mixing bowl, combine buttermilk, TABASCO® Sauce and Old Bay® Seasoning. 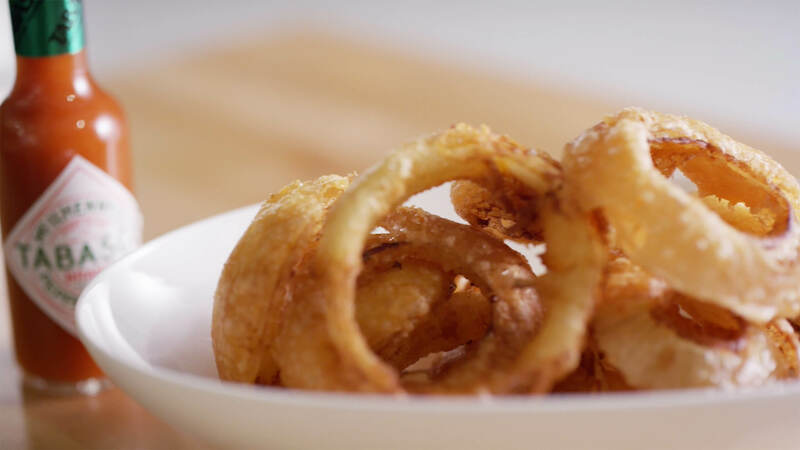 Soak onion rings in buttermilk mixture for 24 hours. In a separate bowl, mix flour and Trisol together. Just before battering onion rings, whisk beer into flour-Trisol mixture. Dip rings into batter and fry at 350ºF until golden-brown, using the swimming method. Remove from oil and place on paper towels to drain. Season with salt and serve.